4th annual Downtown Burbank Car Classic on Saturday August 1, to feature Red Carpet Expo from Petersen Automotive Museum and The World Famous West Coast Customs. Top automotive design will take center stage at the 4th annual Downtown Burbank Car Classic on Saturday, August 1 from 3:00 to 9:00 pm. Included will be a Red Carpet Expo with celebrity vehicles from film and television, along with a display of legendary cars from the Petersen Automotive Museum and The World Famous West Coast Customs. Additional blocks will feature 200 restored and pre-1974 vehicles, exotics, and hot rods. Entertainment will include music, chalk artists and an awards ceremony for the coveted Lifetime Achievement Award. 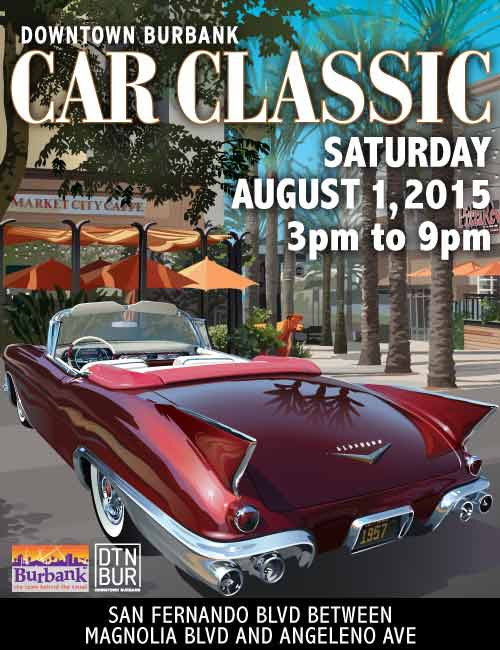 The Downtown Burbank Car Classic is free and open to the public. The Downtown Burbank Car Classic will take place on San Fernando Boulevard from Burbank Town Center to the Holiday Inn. The Red Carpet Expo will be located on San Fernando Boulevard from Angeleno to Olive Avenue, with the Main Stage at San Fernando and Orange Grove Avenue. For more information, please visitwww.downtownburbankcarclassic.com.